A familiar suspense plot of a band of disparate characters in peril becomes fresh again when they are all blind! That’s the premise of the first ever ABC movie of the week “Seven in Darkness”. TV movies usually are not very good, but I have praised here as an exception to that rule many of the entries in ABC’s Movie of the Week series. I do so again this week by recommending the film that kicked this series off in 1969: Seven in Darkness. The plot is at one level entirely stale: A group of disparate characters (each with their own dramatic back story, natch) are in peril and must work together to survive. But the movie throws a spanner into the works of the old chestnut (Yes, that is a split metaphor) that makes it completely fresh: All of the characters are blind! 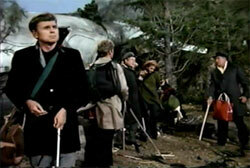 After surviving a plane crash on the way to a convention of blind people, seven people realize that the pilots are dead and therefore no one can guide them out of the wilderness to safety. Terrifying new possibilities emerge within this genre when no one is sighted, making trivial challenges harrowing: Crossing a rotted railway trestle, evading wolves, climbing steep hillsides and determining who in the band of seven has been secretly stealing food. The most effective twist comes as viewers watch in agony as the characters take enormous risks to cross a river because they can’t see that there is a serviceable bridge right over their heads (As your heart sinks watching their struggle, you might find yourself yelling advice). There is also a nice cinematic virtue to the plot set-up: Instead of needing night shoots that are hard to do well and sometimes leave viewers unsure as to what is happening, the film could be shot entirely in daylight because to the characters, it of course might as well be dark out. Human drama is also woven into the story, some of which works well (e.g., The complex motives of Barry Nelson’s psychotherapist character) and some of which falls flat (e.g., Lesley Ann Warren’s hysterics). But the cast generally does a fine job, and fans of Milton Berle will enjoy him as a cranky, selfish man who dreams of having his sight restored by a new medical procedure. It’s a TV movie, so there are no big stars or fancy special effects, and much of it looks like it was shot on a sound stage. But as in prior RBC film recommendation Devil in a Blue Dress, the filmmakers got the most from adding a novel element to old tropes and came up aces. The result is 70 minutes of suspense and entertainment which deservedly encouraged ABC to continue with this format for an extended series of above-average made-for-TV movies. These TV movies were made very quickly. Spielberg said on the documentary about making Duel they started filming only 3 weeks before it was shown on TV. Amazing. That is indeed remarkable by modern standards, though of course in the 1930s and 1940s many films were made that quickly, including classics like The Thin Man and My Name is Julia Ross. Part of the challenge would have been the the inability to change total lenghth much given the constraints of television schedules. I remember watching this on TV many years ago, and it made for riveting drama. It is the confession of the psychotherapist character that is one surprising twist & added depth beyond mere stereotyping.